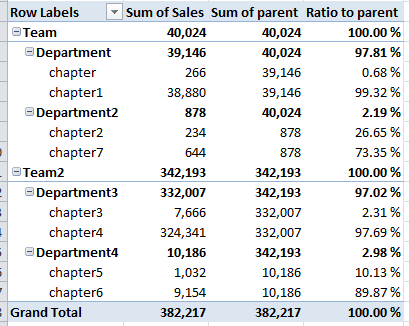 With SQL 2012 PowerPivot we have hierarchies at our disposal, one of the most common calculations we want to do with those hierarchies is doing a ratio to parent. This blog describes how you to do that. 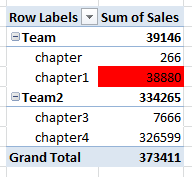 Now we need a new measure that allows us to compare the actual sales per chapter with the sales of the team (or of all the chapters of the same team). 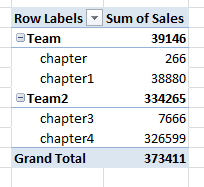 This is a pretty straightforward DAX formula once you understand my second phrase ” all the chapters of the same team”. What we in DAX can do is overwrite filtercontext and that is what we can do here. So that turned out to be pretty easy once you understand the concept. I was – and still am – looking for an example of how to accomplish exactly what the article describes. Unfortunately, the solution is flawed as HASONEVALUE is not a reliable way to determine the current level. If a parent has only one child, in our example, the own sum of sales amount will be returned instead of the parent’s. This can easily be reproduced with the “Music, Movies and Audio Books” category in the Contoso database.